I thought I’d kick off #PumpkinWeek2016 with a bang this year and share with you this Adorable Turkey Crust Pumpkin Pie. The key to assembling the turkey crust, so he doesn’t drown in all that luscious pumpkin filling, is to bake the pumpkin pie partially before adding Mr. Tom Turkey on top. That way the custard pie will be set enough so that the turkey crust will sit on top of the pie and won’t be eaten up and fall to the bottom of the pie, rendering him invisible. That would be no fun at all! **Please Note – The printable recipe card with detailed instructions and complete ingredient measurements for making this Adorable Turkey Crust Pumpkin Pie is available near the end of this post. 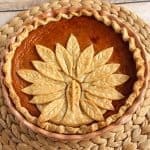 To simplify the process of making this Adorable Turkey Crust Pumpkin Pie I used some store-bought pie crust that can be found in the refrigerator section of the grocery store. If you have a penchant for making your own crust, by all means, use your favorite recipe, but be sure you make enough for a double crust pie. 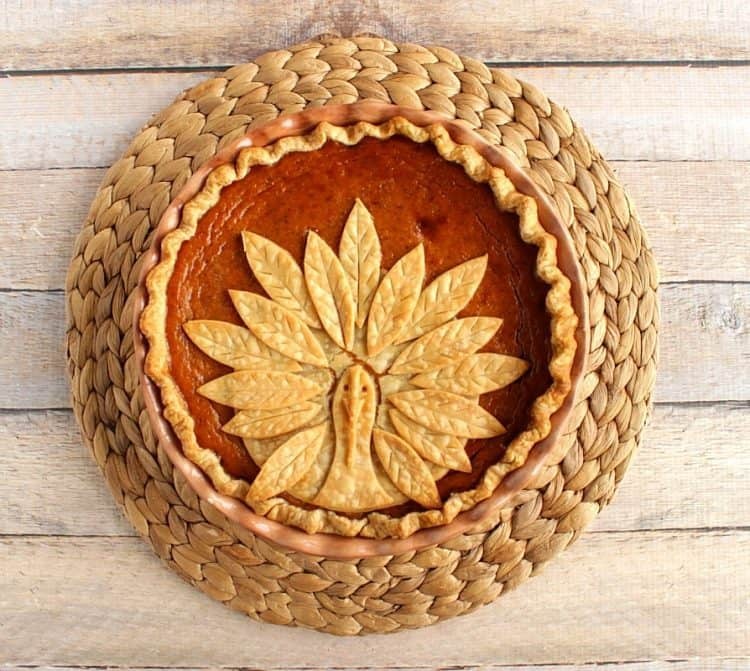 Are you ready to make this Adorable Turkey Crust Pumpkin Pie? Great! Let’s begin! Roll out one pie crust to fit a 9″ pie plate. Roll the dough loosely onto the rolling pin and transfer it to a waiting 9″ pie plate. Gently press the dough into the corners of the plate and up the sides. Crimp the top of the crust however you like. In a medium bowl, whisk together granulated sugar, cinnamon, salt, ground ginger, grated nutmeg, and cloves. In a large bowl, whisk together 2 eggs, pumpkin puree, evaporated milk, and vanilla. Add the dry ingredients into the wet ingredients and whisk well to combine. Once the pie is filled, partially bake it in a preheated 425-degree oven for 40-45 minutes. While the pie is baking, roll out the second pie crust and start trimming the pie crust pieces to form the turkey body. Use water on your finger to “glue” the turkey beak and waddle to the neck and head. Using more water, carefully transfer the turkey neck to the body (a spatula works well for this). Use a small piece of cardboard (from the back of a small note pad), and draw out two sizes of feathers, one longer, and one shorter. Cut out the cardboard feathers to use as a pattern. 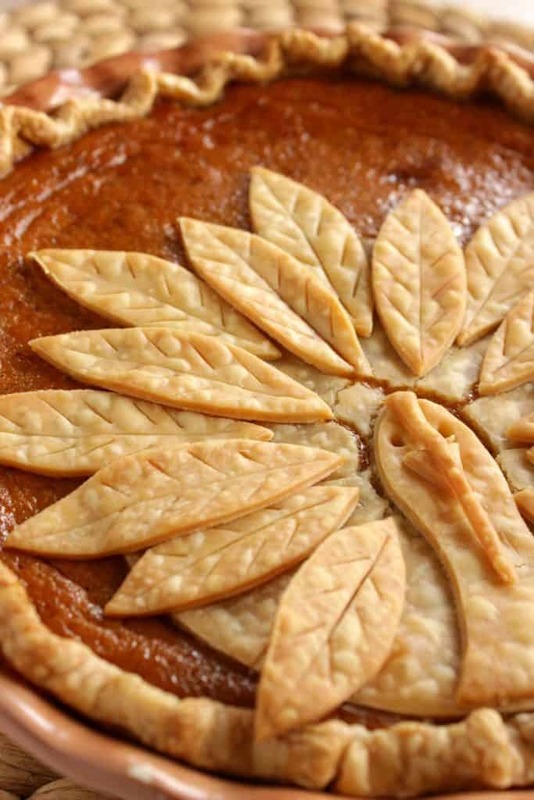 Use a paring knife to trim at least 15 feathers (both sizes) from the remaining pie crust. Carefully use the blade of the paring knife to score lines into the dough to resemble feathers. If needed, use the paring knife to gently fraction the body of the turkey to more easily determine the placement of the feathers. Once the pie is partially baked, it’s time to start assembling the turkey on top of the pie, starting with his body. Use a touch of water to add the feathers, one at a time to the body of the turkey until you like the way he looks. Use a skewer or toothpick to make the holes for the eyes. When the turkey is completely assembled, return the pie to the oven and continue baking until the center of the pie is completely set and the turkey crust is lightly brown and golden. The following Amazon.com items are some suggested products I’ve chosen that will aid you in the making and serving of this recipe if needed. By clicking on the photos, you’ll be taken directly to Amazon.com website if you’re interested in purchasing any of these products. You are in no way required to do so, and you will not be charged in any way unless you decide to purchase a product. Below is the printable recipe card for today’s Adorable Turkey Crust Pumpkin Pie. If you’ve enjoyed this recipe and look forward to making it (or have already made it), I’d appreciate if you’d take a moment to give it some feedback by way of stars near the comment section at the end of this post. Thank you so much! This easy and adorable Turkey Crust Pumpkin Pie will wow your family and friends at the Thanksgiving table. Roll out one of the pie crusts to fit slightly larger than a 9" deep dish pie plate. Loosely roll the pie crust upon the rolling pin and transfer it to a waiting 9" pie plate. Gently unroll the crust and evenly press the crust into the corners and up the sides of the plate. Crimp the edge of the crust with your favorite method of decoration. In a medium bowl, whisk together the sugar, cinnamon, salt, ginger, cloves, and nutmeg. In a large bowl, whisk together the eggs, pumpkin puree, evaporated milk, and vanilla. Add the dry ingredients to the wet ingredients and whisk to thoroughly combine the pie filling so that it's creamy, with no lumps. Carefully pour the pie filling into the waiting pie crust in the pie plate. Partially bake the pie in a preheated oven for 30-35 minutes. While the pie partially bakes, roll out the second pie crust. Use a small 5" - 6" bowl as the body of the turkey and use a paring knife to carefully cut around the bowl on the crust. Using the paring knife cut out a neck and head shape for the turkey, along with a small triangle for the beak, and also a long skinny piece for the turkey waddle. Wet a finger with water and use it to attach the turkey beak and waddle to the head of the turkey. Using additional water (as glue) and a spatula, transfer the turkey neck and head onto the bottom of the body of the turkey. Use your fingers to re-shape, if needed. To make the feathers, use a small piece of cardboard (from the back of a notepad) and draw out two sizes of feathers (one long, and one short). Use scissors to cut the feathers from the cardboard, and then cut at least 15 feathers (long and short) from the remaining uncut pie dough. Gently use the paring knife to add the veins to each feather, making sure not to cut through the dough). Also, use the paring knife to gently and evenly fraction the turkey body to help with the placement of the feathers. Remove the partially baked pie from the oven and use a spatula to gently place the turkey body (including the neck, head, beak, and waddle) and on top of the pie, right up to the edge. Using the water as glue, place the feathers, one at a time, on the body of the turkey overlapping as needed, and to your liking. Use a toothpick or skewer to add small holes for the turkey's eyes. **NOTE - If your outer pie crust is turning too brown before the turkey is golden, cover the outer rim of the pie crust with aluminum foil and continue baking until the pie is set and the turkey is golden. 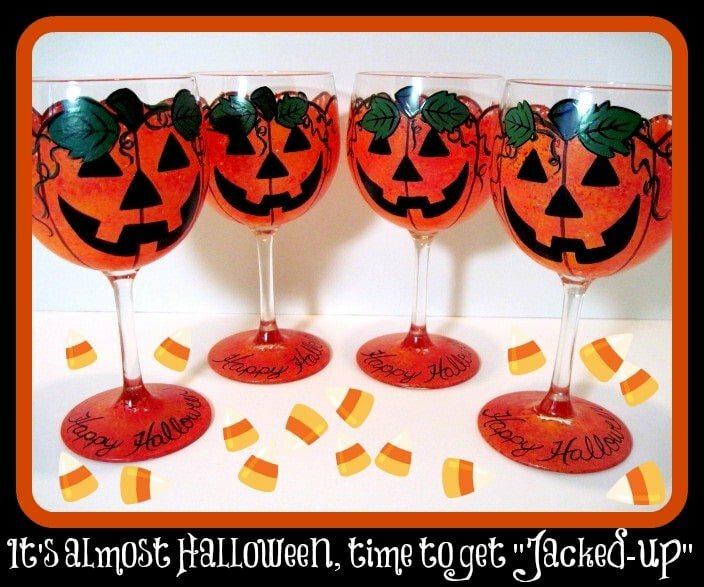 In honor of pumpkins and pumpkin lovers everywhere, I’m coordinating this recipe with this set of four fun and whimsical Jack-O-Lantern wine glasses. They’d be fun for any sort of Halloween party, OR minus the faces, they’d look great on any Thanksgiving table. And, they would certainly be a fun conversation starter before you serve that Adorable Turkey Crust Pumpkin Pie. This recipe post for Adorable Turkey Crust Pumpkin Pie is proudly featured on Meal Plan Monday. I sincerely hope you’ve enjoyed today’s recipe for Turkey Crust Pumpkin Pie as much as I’ve enjoyed bringing it to you! I LOVE this! It is absolutely amazing and your artistry really shows in everything you do! It is adorable Renee and your pumpkin wine glasses are wonderful. That definitely is adorable! What a perfect Thanksgiving treat! I may just have to give this a try! I hope you do, Carlee. I know you’ll have success. This is amazing! I’m so impressed! Pinned! Thank you so much, Kelly! I appreciate that! Thanks, Cheryl. It’s actually so easy to make that it’s not a big deal to eat it. Oh my gosh! This is absolutely stunning! I’d love to have it on my Thanksgiving table! This is the cutest thing ever! 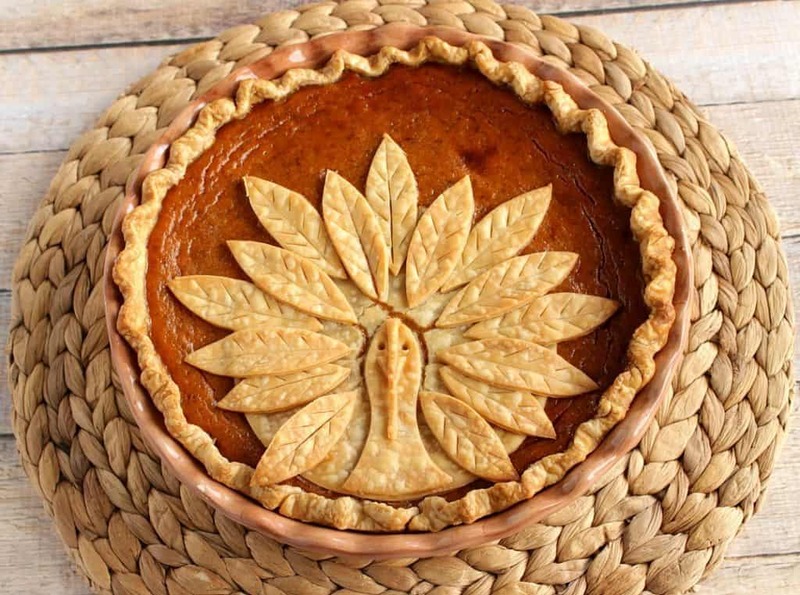 I am in love with this pumpkin pie design! You make this gorgeous pie look so easy to make!! What an amazing pie, Renee – you make it look so doable! Thanks, Melanie. It is doable. I hope you’ll give it a try. A beautiful pie and really great tutorial. I, pinning it. I’ve got to try making this! I know you’ll be successful. Please share your photos. I’d love to see it. WOW! This pie is gorgeous! What a fun way to top it! You’ve outdone yourself Renee — sharing! I thank you so much, and always appreciate a share! So beautiful! Thank you for sharing. I hope to make this for Thanksgiving. My pleasure, Luisa! I just finished making a video about how I made him, so I’ll add it to the post. Please come back and check in a day or two if you’re able. Amazing, Renee! What a great tutorial! I’m a visual learner so tutorials are important to me. So glad you like it, Cindy! Very cute and a great tutorial! I smile every time I see it on pinterest! Oh Renée, thanks so much for this cute idea to make the Thanksgiving meal even a little more special! I use my husband’s grandmother’s handwritten recipe for pumpkin pie, and it is killer! It makes THREE pies, which my grown children love, because it means there’s always pie for them to take home, along with all the other leftovers. Can’t wait to surprise them with this! Adorable! Wow. This is absolutely amazing. At first glance, I gasped. So originally delightful and creative. I looove it. What a lovely thing to say. Thank you so much, Liz. I’m happy you like it, and I’m thrilled that you stopped to visit me here in my Kudos Kitchen. I definitely think you can make it ahead and freeze it. However, I’ve not done it so I’m not 100% positive. If you plan on reheating the pie before serving, I’d make sure to bake it uncovered for only like 15 or 20 minutes at 350. I would also thaw the pie first. If you plan on thawing it (after it’s already been fully baked) and then serving it at room temperature, I’d uncover it while it’s thawing so condensation doesn’t make the pie soggy. Remember when you’re first making the pie, as the recipe states, partially bake the pie first so the pumpkin custard is somewhat set before you start assembling the turkey on top so he doesn’t sink in the filling. Please let me know if you have additional questions, I’ll be happy to help. And thanks so much, Stacia for visiting, and for your great question. I cannot wait to try this! It is soooo adorable. Thank you, Lynne! I know your family and friends will be impressed! Have fun with it and make it your own! Renee, this is just gorgeous. It appeals to my artistic side (as a decorative painter) too. Very cool, Julie. We are kindred spirits then! Very good to know! Thank u so much. It is gorgeous. I’m going to give it a try this year! I love it. Thanks. That’s wonderful, Mayra. I know you’ll be successful with it and that you’ll surprise your friends and family with how creative you are! This s so cute! 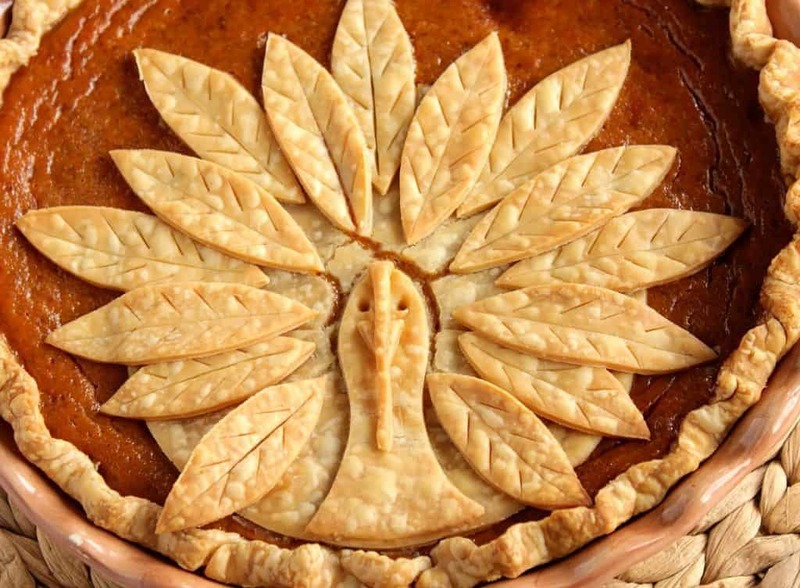 I am doing this on the next pie I bake (even though it probably will be a wonderful chicken pot pie (Donal Skehan has a great recipe) and not a pumpkin pie 😉 ) Have a nice day! Okay, I love, love, love that you’re going to put this on a savory pie! I’m going to have to do that too. Thanks for the inspiration, Malene (and thanks for stopping by)! Do you brush the turkey cutout with anything before you put it back in the oven? Thanks! Do you recommend making this Thanksgiving Day? Could it be made the night before? Thanks! Thanks for the question. You can definitely make this the day before. After the pie has cooled, remember to refrigerate it. Take the chill off the pie for about 30 minutes before serving by sitting it out on the kitchen counter. Very festive pie for the Holidays! Thank you, Caleb! I’m so glad you like it!! I love this idea, and I wanted to try a slightly simplified (just less feathers) mini version on some mini apple pies I’m making in a cupcake tin. Because these will take less time to bake than a full size pumpkin pie, at what point do you think I should add the crust? Thanks so much! Since you’ll be adding the turkey crust to an apple pie that has more structure than a custard pumpkin pie, I’d go ahead and add the crust right away. The only reason I added the turkey crust to the custard pie after partially baking was so the custard had a chance to partially set so the turkey crust wouldn’t sink to the bottom of the custard. The only thing I will caution you when adding the crust to an apple pie, is that the crust will conform to the shape of the apples upon baking, thereby making your turkey (possibly) lumpy. I can’t say that for 100% fact, but it’s just something I think I need to caution you about. I hope this answers your question. Thanks for asking. Looks great! however, I’m wondering why such a long cooking time at such a high temperature? It seems like the crust would burn and the custard over done at that temperature. Thoughts? Thanks for the question. I wrote the recipe with how long it took me in my home oven. If you’re worried that the temperature is too high, feel free to turn the oven down to 375-400 and then keep an eye on it. The actual baking time is really only 1 hour and 15 minutes, but if you’re worried the crust will burn and the custard will be overdone, feel free to cover the pie at some point. Of course this will hinder the browning of the turkey on top. This is so cute! I’m wondering…do you think the turkey could be baked separately then laid on top of the pie afterwards? Hi Jillene. I really have no idea because I haven’t tried it, but I honestly don’t see why not. The only problem my be that he wouldn’t actually be attached to the pie, and may slide. Other than that, I can’t really think it would be a problem. If you do it, let me know how it works for you. Hello, so I’ve never made a pie before but I want to do this. I was wondering what is the best way to transport this pie from my house to another with out it getting messed up? Also does it have to be fresh spices or can I get everything out of a jar? This might be a silly question, but do you think this would work with a cherry pie? Hi Holly! Not silly at all. The only thing that would probably happen is that the Turkey would conform to the shape of the cherries as they cooked down. I couldn’t guarantee how he’d look after that, but I’d give it a try if I was you. Let me know how it works for you if you do it. Happy Thanksgiving! Very cool! Thanks for letting me know, Sarah!! I made this pie tonight for Thanksgiving tomorrow and it was an overall success. The only issue I had was that the edge of my crust was starting to overcook before the turkey piece was thoroughly browned. I tried a foil tent, but that just prevented him from browning. He’s done. Just looks a bit pale compared to the rest of the crust! I’m sure it will still be a hit. Thanks for the post! Awesome! Perhaps a foil tent around the perimeter would have worked better but I don’t know because I didn’t have to do it. Unfortunately every oven is different so it’s difficult to know for sure. I’m happy you had overall success. Ill bet he’ll be a big hit! Thanks for letting me know. I am thankful for readers like you who take the time to be so caring and thoughtful, Karen. Happy Thanksgiving to you and your family as well. Enjoy the pie, and have a wonderful day! This makes me so happy, Ryann. Thanks for letting me know, and Happy Thanksgiving!!! Looks gorgeous. How long do you bake the pie before you put the turkey on it? It’s in the directions, but since you’ve asked, it’s 40-45 minutes to partially bake the pie before adding the turkey crust. I would suggest, however, going back through the actual recipe to follow the other tips and suggestions if you have the time. Thanks for your questions. Happy Thanksgiving! I think I will make and bake the turkey’s a day ahead then just lay them on the finished pie. Plan to make them to sell at our church youth baked goods auction! I hope your pie brings in lots of money for your church’s youth group. Good luck! Oh my gosh. This is seriously the cutest. I can’t wait to make it for Thanksgiving this year! Thank you, Melissa! This is my most popular Thanksgiving recipe and people go crazy for it every year. Super cute! 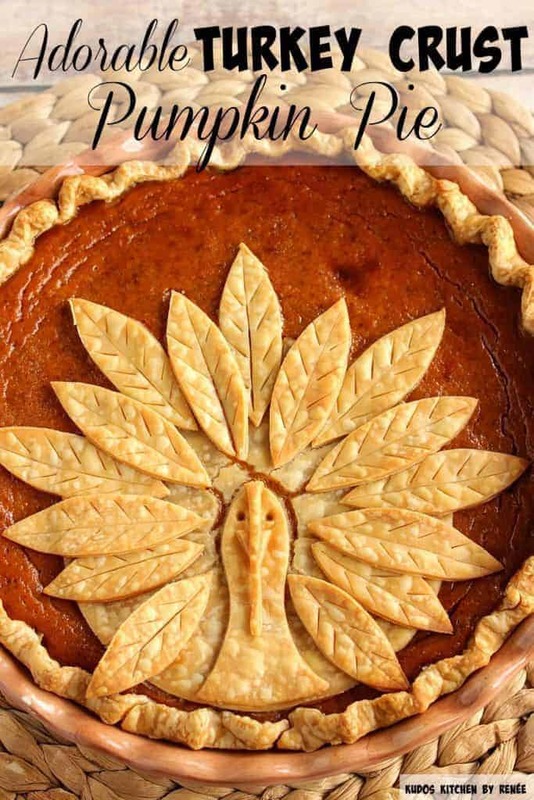 Would love to make this for Thanksgiving!